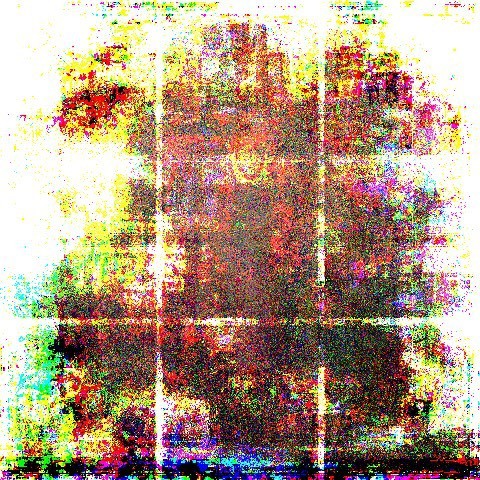 a series of computer-generated pieces created through the analysis of many different photos, portraits, or images. source photos are evaluated pixel by pixel, and the most commonly occurring red, green and blue values are used to create an entirely new image. "trans-siberian: corridors", august 2016. created during the #slowtrain residency for china residencies. while traveling along the trans-siberian railway (mongolian route) from moscow to beijing. "composite fluxer", november 2015. using 186 photos of former flux factory residents. created for the fall 2015 flux factory arists-in-residence show & benefit. "trans-siberian: landscapes", august 2016. created during the #slowtrain residency for china residencies. while traveling along the trans-siberian railway (mongolian route) from moscow to beijing. "trans-siberian: selfies", august 2016. created during the #slowtrain residency for china residencies. while traveling along the trans-siberian railway (mongolian route) from moscow to beijing. "composite president", july 2016. using 43 photos of elected presidents of the united states of america, sourced from their wikipedia profiles. "composite presidential candidate", july 2016. using 24 photos of candidates in the 2016 united states presidential election, sourced from their wikipedia profiles.